Our best wishes go out this week to William Szathmary on his 92nd birthday. Who is William Szathmary? None other than Bill Dana, one of our favorite and funniest Jewish comedians. Bill's main claim to fame is in assuming the character of Bolivian astronaut, karate expert, and Santa Claus instructor Jose Jimenez. As we reported last month, he also wrote the Sammy Davis Jr. script for All in the Family. Last year we profiled Bill as part of our series on The Great Jewish Comedians. Because you liked them so much, we're repeating the videos of Bill explaining how he came up with the character and his distinctive accent in 1959. Bill's birthday is prominent on his Facebook page this week. 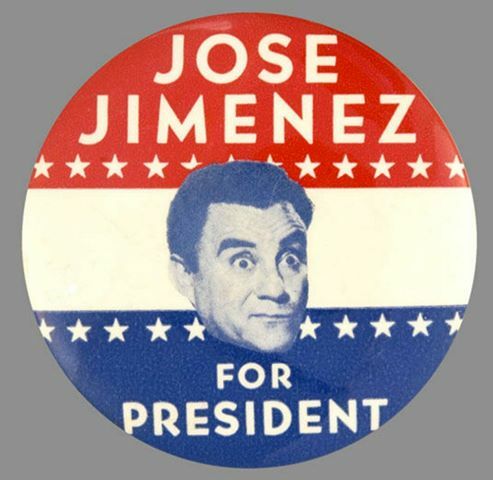 That's where we found the Jose Jimenez for President button. 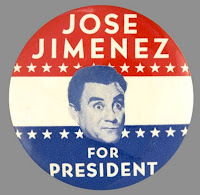 Considering the election shenanigans this year, we're thinking he might not be a bad choice. I never get tired of listening to : My "ney"...Jose Jimenez. And I have such a good laugh. I was just thinking of Scott Glen's impression of Sam Shepard's impression of Bill's impression (can you do an impression of your own character?) of Jose' from "The Right Stuff". That stole several scenes and really added to the film didn't it?